I am currently using a Drop App to get rewards. You can find it in App Store (by Drop Loyalty). Drop is a first-of-its kind mobile rewards program. 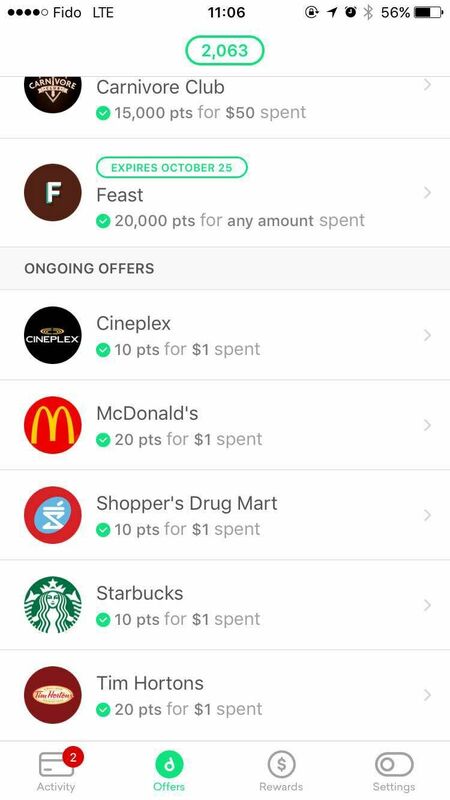 Members can link their credit/debit cards to the app to start earning points from their favourite brands. Earn points toward amazing rewards you actually want. Earning and redeeming is effortless, eliminating the need to carry loyalty cards and pull out apps to scan in-store. First, link your debit/credit cards to the app. Any time you spend at your activated offers using those cards, you will get points. Once you have linked one of your debit or credit cards to Drop, Drop will collect your transaction data to provide you with Drop points. In addition, Drop can learn what you like, so they can find rewards that you actually want. I like the Tim Hortons (1% return), McDonald's (2% return) and Shoppers ones (1% return). Please remember that you can also get rewards from your credit card itself. For example, if you use PC Financial WEMC at Shoppers, you can get 3% return from your credit card and 1% return from Drop App (totally 4% return). Your points may take up to 5 days to be issued. The speed of your points will vary depending on the card used and the merchant you have shopped with. Drop points will expire one year after the day they are earned. You are unable to transfer your points to another member. If you want to delete your account, you need to contact Drop at support@earnwithdrop.com. Once your account has been deleted your current Drop points balance will be eliminated and will not be able to be retrieved. Drop also has a referral program. You can send your "Invite Code" to your friend, with which both of your can get 1000 points ($1 value). You will receive your bonus referral points after the friend you have shared it with has entered your unique code in their Drop settings => "Have a code?". Once the code has been entered you will receive your points immediately. Tap the settings gear in the top right corner. Select 'share your code' and choose your method of sharing. Note: The invite code is case sensitive. Please use all lower cases. Thanks. BTW, If anyone wants to leave his/her drop invite code below, please use the following format ONLY: "My drop invite code is: *****. Thanks." Other invite codes will be deleted. And repeated entries could also be deleted. Thanks.